Charitable Organization Promoting Awareness and Raising Funds Throughout September. Tucson, AZ, September 21, 2018 --(PR.com)-- Beads of Courage, Inc., a global charitable organization, is commemorating Childhood Cancer Awareness Month with several initiatives in September. The mission of Beads of Courage is to provide innovative arts-in-medicine programs that improve the quality of life of children and teens coping with cancer and other serious illnesses. The signature Beads of Courage program provides hospitalized children with symbolic beads that mark every step of their treatment journey and honor their courage in their fight for life. 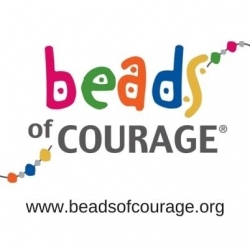 Throughout September, Beads of Courage is holding its 10th Annual Bead Challenge, a nationwide event combining fundraising with a challenge to glass bead artists to make and donate as many beads as possible for children in the Beads of Courage program. Glass art studios around the country are hosting Open Studio events during Bead Challenge to share their artistry with the public and support the Beads of Courage mission. The public is also invited to “Sponsor a Bead” online for just $5 at www.bocbeadchallenge.org. Each sponsored bead is given to a child in the Beads of Courage program to add to their bead strand in recognition of their courage during treatment. Bead Challenge continues through September 30. Additionally, Beads of Courage is dedicating its 6th consecutive bead to pediatric hematology/oncology nurses this month at the Association of Pediatric Hematology/Oncology Nurses Annual Conference. The bead was created from an original drawing by a seven-year-old Beads of Courage sibling and depicts a butterfly taking flight, symbolizing the qualities of strength and grace. The bead dedication is sponsored by Northwestern Mutual, a corporate partner of the Beads of Courage organization. In a further collaboration with Northwestern Mutual, Beads of Courage will distribute 1,000 hand-strung bead necklaces this month to hospitalized children featuring the exclusive Gold Origami Crane pendant. Gold is the official color of childhood cancer awareness, while the origami crane represents a wish for peace, healing and happiness. Northwestern Mutual employees throughout the US have been creating the necklaces at bead-stringing workshops in their home offices and at nearby children’s hospitals. The Beads of Courage Gold Origami Crane pendant is available to the public for a donation of $15 each with proceeds benefiting the Beads of Courage mission. Every time a Gold Origami Crane pendant is ordered online, Beads of Courage gives one to a child being treated for cancer or another a serious illness with wishes for hope and healing. Visit www.beadsofcourage.org > Shop. Source: Beads of Courage, Inc.
About Beads of Courage: The mission of Beads of Courage is to provide innovative arts-in-medicine programs that improve the quality of life of children coping with cancer and other serious illnesses. Beads of Courage programs are evidence-based interventions designed to strengthen resilience, alleviate suffering, and improve the psychosocial adjustment process. Beads of Courage is a 501(c)(3) tax-exempt organization. For more information or to donate, visit www.beadsofcourage.org. Click here to view the list of recent Press Releases from Beads of Courage, Inc.